Ballywillan was one of the earliest congregations in the district, for Gabriel Cornwall of ‘Balliwoolen’ appears in a list of 14 ministers in 1655 who received grants from the Commonwealth government. Mr Cornwall preached in the old parish church at Crossreagh crossroads until 1661 when he was ejected for refusing to be re-ordained by a bishop when the Monarchy was restored. The Ordinance Survey Memoirs of 1835 note that there was a tradition that there had once been a Presbyterian meeting house in Maddybenny. This may have been a primitive meeting house or merely a barn or such building on Mr Cornwell’s own property which he used when conditions improved sufficiently for ministers to begin to preach to their people again. Later the congregation obtained a site at McIlvennon West on which to build a church, but the date is not known – their subsequent churches have all been built on this site. The next we know is that a new church was built to replace the old one, which was thatched and had outside steps leading to the gallery. The new church, built in 1828, cost £600 and the architect was Angus Cameron of Ballymoney. It was a bare whitewashed two story building measuring inside 54 by 30 feet with 16 windows but it was so plain that it was said to look more like a barn than a church. The pulpit (with the precentor’s seat below it) and the reading desk were at the centre of the side wall and there were 2 doors, one at each end of the building. The gallery containing 37 pews was supported upon 6 metal pillars and the stairs leading up to it were at both ends of the church. When Ballywillan church was rebuilt in 1889, the Rev Huey’s son John presented a three light stained glass window in memory of his father and mother and Mrs Catherine Huey (his second wife) presented communion plate and linen. The window is said to have been originally intended for Capetown Cathedral. Later Rev Hugh Wells was ordained as minister in 1879. Mr Wells considered repairing the church but when the office bearers canvassed the congregation it was found that about £800 could be raised and it was decided that so large a sum should not be spent on the old structure. Mr Wells went to England to raise additional funds and the old church was completely demolished. 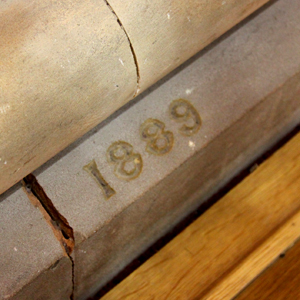 The foundation stone of the new church (built on the old site) was laid by Mr William Young J.P. of Fenagy in August 1888. The new church (the present church) is built of black stone, faced with sandstone from Dungiven quarries, was opened on 14th July 1889. The Thompson memorial pulpit and the Huey memorial window were dedicated. There are also two stained glass windows in the church in memory of the Law family of Maddybenny – the Rev James Law was minister of Richibucto in New Brunswick and the window in his memory was presented by his son Bonar Law, later Prime Minister of Great Britain. In 1900 an approach road to the church was made through a plantation from the Portrush road. At the same time repairs were carried out to the church, the session room and the school. In 1934 the church hall was built at a cost of over £1,700. Mrs Wells performed the opening ceremony after being presented with a key by Mr William J. Holley, the contractor. In 1959 the Alexander family presented a pipe organ in memory of Mr and Mrs Hutchinson. During the ministry of the Rev James Frazer the 1934 hall was extended and joined up with the church and a new entrance made to the main road.